We're nearing the half-way point of the season and the Penguins look like the best team in the league, while the Blue Jackets have surprisingly all but locked-up a playoff spot. Each month is an end and a beginning for each NHL team. String a few good months together and it probably means a playoff berth. A couple bad months though and that’ll cost you. Every month we like to highlight three teams that are trending up and three teams that are trending down to get a better sense of the landscape of the league. These aren’t your typical trends citing best and worst records in the league because those things can be fickle over a single month of hockey. Instead we’ll dig a bit deeper toward each team’s underlying numbers. 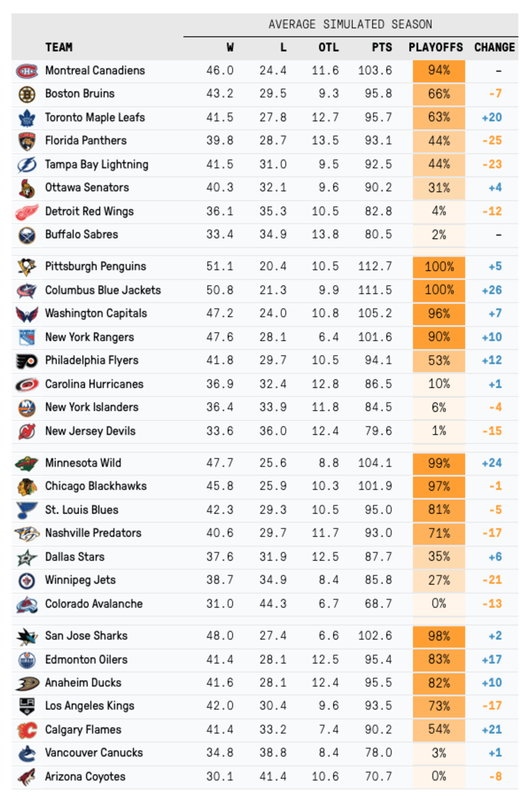 We’ve got a projection model that assesses each player’s value that’s updated daily throughout the season that can estimate point projections and playoff chances. It’s based on the past three seasons of a player’s Game Score and it’s what we used for season previews for each team. 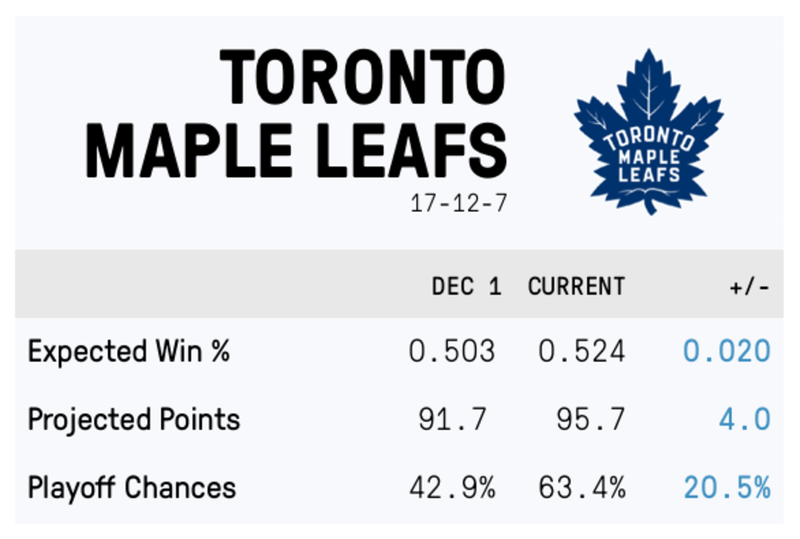 These posts are a way to check in with how teams have progressed, comparing how good they were projected to be at the start of December and how that’s changed since. Here’s which teams are playing better and worse over the last month, as well as a look at the current projected playoff picture. We try not to focus on the same teams every month because that gets boring, but we can’t ignore these two despite being featured as two teams on the rise in November. What each did in December was build on that promise. 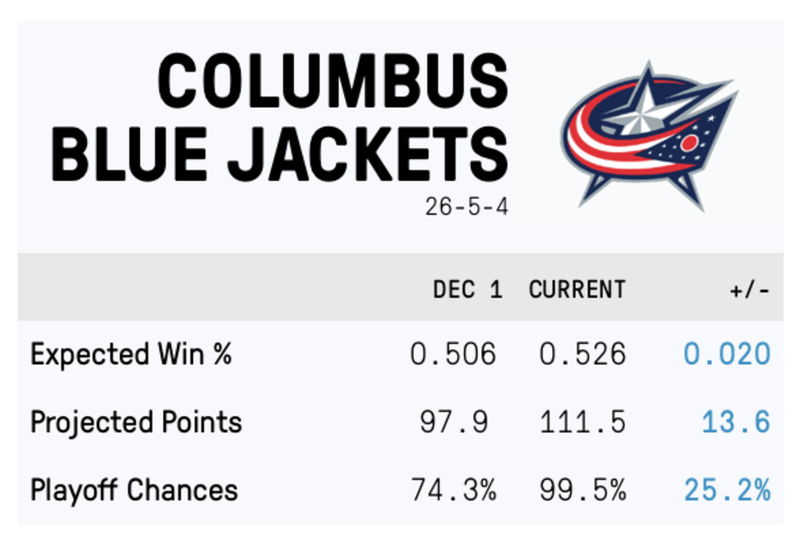 Columbus won every single game in December, as you may have heard and lead the entire league in points. At this point, they’re now a virtual playoff lock and while the model is hesitant to call them the best team because they have zero history of being this good, they’ve vaulted into the top 10 in the entire league for team strength. Toronto had a pretty great month too and is on a winning streak of their own and now there’s playoff buzz surrounding the team. With the way they’ve played, dominating the shot clock on most nights, and how their rookies and goalies look of late, they have a very real chance. Both teams were top five in expected goals last month according to Corsica which bodes well for their play going forward. Two teams many pegged as basement dwellers are showing the world they had other plans this season. The team that got the Other Streak that didn’t get as much hype as the one in Ohio, but was still damn impressive. The Wild rattled off 12 straight wins before being unseated by, who else but Columbus, and are looking like one of the league’s best teams. 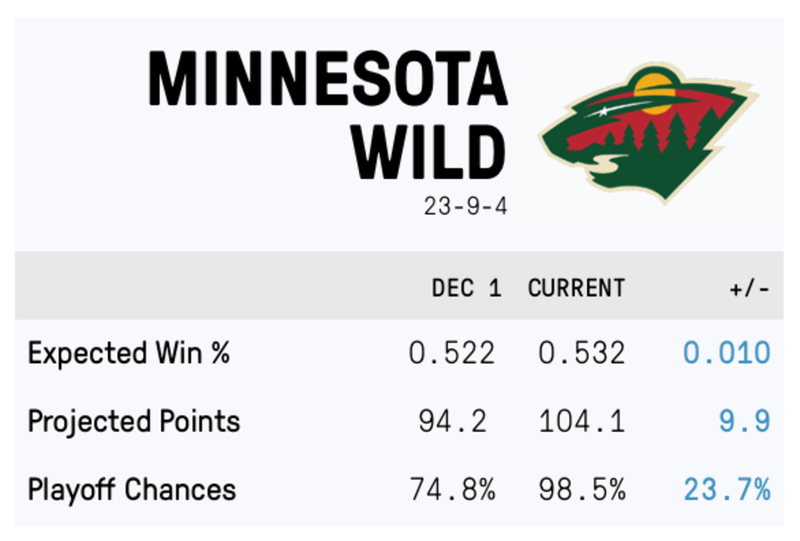 Call it the Bruce Boudreau effect because all he ever does is win division titles and that’s exactly where the Wild are projected to land this season. Their PDO is off the charts, so expect them to cool off soon, but the real story here is Devan Dubnyk who is having a Vezina calibre season. He’s looked unbeatable on most nights and he’s the reason they are where they are now. Their shot attempt rates were just break even for the month, but they were second best by expected goals which means they’re getting a much better share of high quality chances. The team won’t play as good as that last month of hockey, but they’re marking their territory at the top of the Central, a place very few expected them to land at start the year. The way the Penguins are playing is on another level right now and they’ve got a legitimate chance to be the first team to repeat as Cup champs in almost two decades. It’s a difficult task, but this Penguins team can do it. They have arguably the league’s most potent offense led by Sidney Crosby, Evgeni Malkin, Phil Kessel, Kris Letang and the underrated Patric Hornqvist. That’s a top five that very few teams can match up against. The pain of the Johnston era is all but forgotten now and coach Mike Sullivan has them playing their best hockey of the Crosby/Malkin era. The Pens averaged just over four goals per game in December which is simply an absurd number that doesn’t even make sense in the year 2017. Sure, some of that was shooting luck, but they also fire a ton of pucks on net and that’s the biggest reason for their dominant offense. The defense is a trouble spot, but when you can score like this it almost doesn’t matter. I know the Columbus hype is real, and those Blue Jackets demolished this very team, but for my money this Penguins team is the league’s best. I’m not sure it’s even particularly close either. For November, the Kings were pretty much playoff locks despite struggling to win games because they have a strong team that was expected to win more in the future. Well, they’ve still struggled to win and they haven’t looked their usual selves either. Now their playoff ticket is much less safe than it was a month ago. 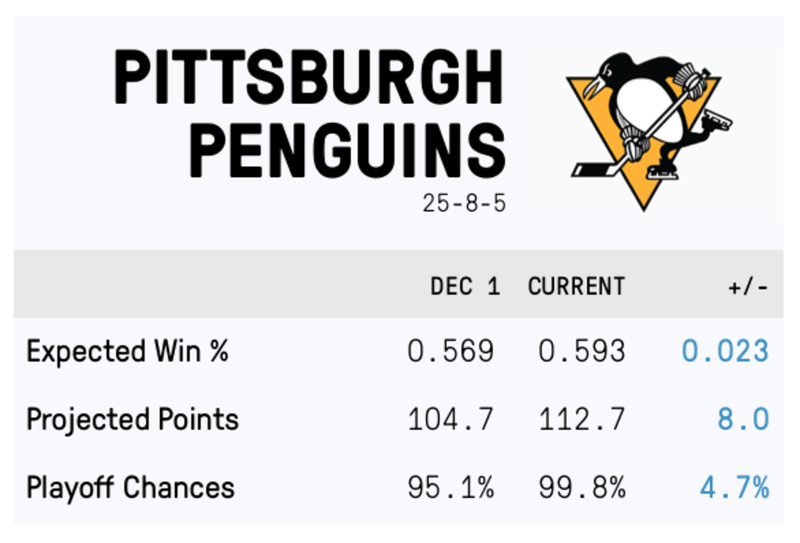 The team known for being a Corsi powerhouse was just sort of okay for December, registering 51 percent of the attempts, a far cry from their usual 55 percent or more. Injuries are taking their toll here and their depth just isn’t what it once was. 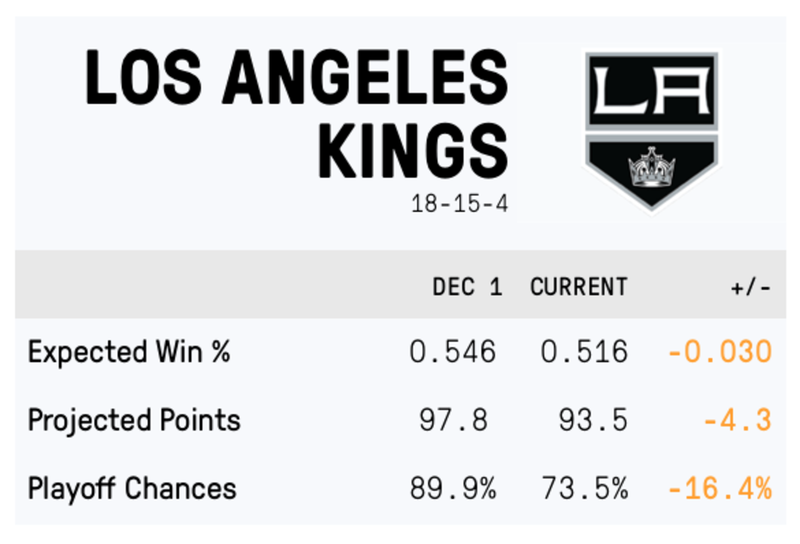 The Kings are a perennial contender, but the way they’ve played, they look more like Round 1 fodder for a much stronger team. When players return, they’ll surely be better, but it’s hard to be impressed with their 2016-17 season, even for a usual advanced stats darling. 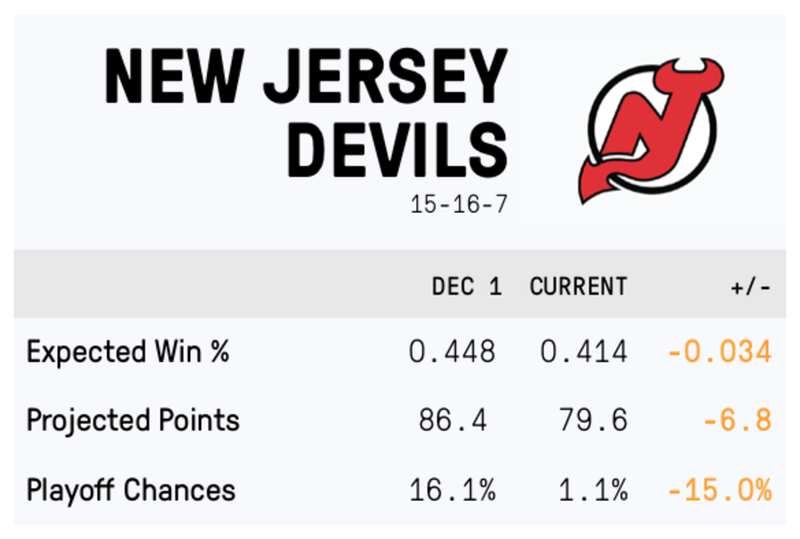 The season started with a lot of promise for the Devils, but they’ve been a hot mess ever since. Since starting the season 9-3-3, they’re 6-13-4 and are nearly last in the East by points percentage. In December, they controlled just 44.7 percent of the expected goals, better than only Vancouver and the next team on the list, and are now the third worst team in the league in that department. It’s pretty easy to see why because the team is basically Taylor Hall and, uh, well, some other guys that also happen to play hockey. Usually you’d be able to say that they at least have Cory Schneider, one of the league’s best goalies, but he’s been absolutely brutal this season. Schneider is a perennial .920 goalie who’s pushing a .906 this season. At some point that’s gotta swing back the other way, and maybe Monday night’s shutout win is the starting point, but it’s a bad sign when even the team’s most dependable player starts playing as awful as the team in front of him. Woof. Remember the optimism around this team when Patrick Roy was fired? Finally, they’d get something out of this team. Things haven’t exactly gone that way. The coach was a problem, yes, but the other one was that they just didn’t have any good players outside of their core. The team had some of the worst depth options in the league to start the season by Game Score, and they look just as bad as anticipated. Losing Erik Johnson hasn’t helped, but even with him there they’d probably still be a disaster, just on a smaller scale. At the start of the month, this team was an expected .450-ish team, now they’re much closer to a .400 team which is about as bad as it gets for hockey. The reason is simple to see too as they simply get dominated every night and that got worse in December. Their expected goals rate was under 40 percent for the month, much worse than their 44 percent Corsi. Both numbers were a league worst, but what that shows is that not only is Colorado losing the shot battle, but they’re giving up more premium chances too. That’s never a good combo and it’s why they’re getting lit up daily and struggling to score. 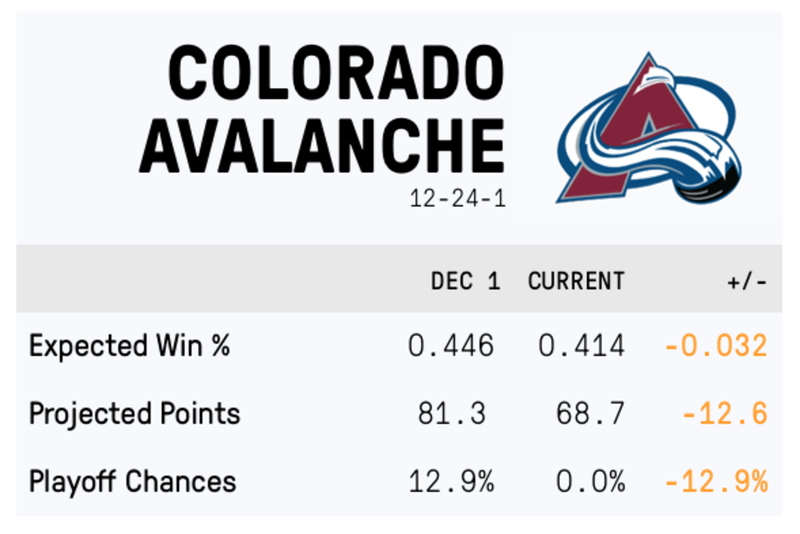 Toss in a terrible special teams unit at both ends of the ice and you get the Avalanche: arguably the league’s worst team, again, and a team that is pretty much already eliminated from playoff contention by Christmas. The league is nearly halfway through the season and the playoff hunt is not only heating up, but also becoming much more clear cut. There’s a lot of teams that are pretty much locked in already based on points they’ve banked and how good they are, even if they haven’t technically clinched yet. Still there’s some spots open: two in the Atlantic, one East wildcard, and probably both wildcard spots in the West. Based on the games that have already been played, and what we think is likely to happen over the next 45, here’s how the playoff picture shakes out. Please note: 100 percent doesn’t mean clinched and 0 percent doesn’t mean eliminated. They mean the teams made it into the playoffs in almost every simulation except in less than 0.5 percent of cases. In the East, Ottawa is still in a spot, but it’s looking more and more precarious by the day. They rank bottom five in Corsi and bottom 10 in expected goals all while playing in front of Mike Condon, whose play has already began to slip. The biggest reason they’re where they are is an unsustainably high win record in one-goal games, something that is usually due to random variation instead of talent. Toronto is making a push lately and they look more likely than not to get there over the Senators, as do the Bruins who lead the league in expected goals percentage. Toronto is second. The Metro looked like they had the two wildcard spots locked in a couple weeks ago, but Philadelphia has really slipped lately and that race looks very wide open with any of the three teams mentioned above getting in, or even one of the two Florida teams. Out West, the top eight look mostly locked in, but Calgary and Dallas – who are only in a spot because of games in hand – could make things very interesting down the stretch.